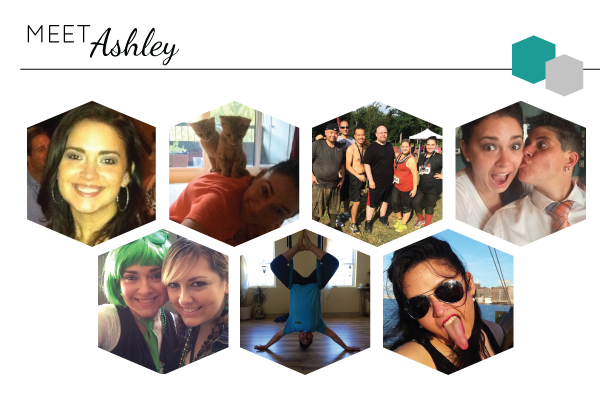 I’m so excited to introduce you to my BFF (and favorite travel/adventure buddy) – Ashley! She will be sharing posts on some of her interests, like cooking and staying fit. Ashley has been a huge inspiration to me (also, isn’t she the prettiest!?) and I’m excited for her to share some of her favorite recipes and fitness challenges! I pick up everything with my toes. Everything. The other day, I picked up a slice of cucumber that rolled off my salad with my toes. I began fostering kittens for the Maryland SPCA this year. It’s one of the most rewarding and challenging experiences of my life. Cheese is my biggest weakness. Or chocolate. No, cheese. Dang it, I want another peanut butter cup. I’m training for a half marathon next month in San Francisco. I use the term “training” loosely, as I’m really just occasionally walking or jogging and I’m going to do it regardless of how well I train. I will probably also regret that decision. When I was 21, I resolved to travel to at least one new place each year. I’ve been to multiple countries in Europe and am planning a trip to Australia next year with Misty. Hozier is my current obsession. Have you heard his music? If not, I highly recommend listening to “Take Me to Church” at the very least. Maybe I have two obsessions right now. Have you played HearthStone? It’s an addicting online game to which I’ve devoted many hours. I also enjoy Last Night on Earth, Settlers of Catan, and many other board games. Every time I have played “Two Truths and a Lie” with new people, one of my truths was that I was born with a tooth. I dip my fries in mayonnaise. Everyone should dip their fries in mayonnaise. I like making bulleted lists. I’m looking forward to sharing my thoughts and experiences with you. I love to talk – especially about food. I already have a few recipes I plan to share in the coming months. Those things seem more interesting than knowing that: I’m about to be 30, I’ve lived in Columbia, MD since I was 11, and I’m a Business Manager at a marketing company. I’m fortunate to be where I am in life and I’m looking forward to sharing a part of my journey with you.